I’m not really sure how this outfit came together, but I’m fond of the odd British vibe about it. Kind of like a cross-dressing Sherlock Holmes. I’ve been wanting to style this lovely skirt by Megan Nielsen again, but for whatever reason, I had it in my mind that only lace-up black boots would do. Thank goodness I swiped these Pour la Victoire boots when they went on sale. I can’t help but feel a little Rock Horror Picture Show-ish when I wear them. black looks so great on you! I really like hats on you, this one in particular really complements your hair as well! It obviously happened for a reason – I think I'm going to start channeling a cross-dressing Sherlock Holmes more often. Urge to sing Sweet Transvestite Sherlock Holmes is quite strong. I love the wrap, it's beautiful and looks so warm. i love the way you wore…it..perfectly topped with the bowler hat…. You look so pretty, so elegant!!! Nice look, I approve. And as we're talking of British things, I just want to debunk the myth that British people have bad teeth. I just don't see it. In fact, I have lovely teeth. there's almost a schoolgirl vibe that I get from this outfit too – however you put it together, I love it! you look great, so chic yet cozy as well. love the boots too. hope you're having a great new year so far! so chic! i love your cape! Cape is awesome ! the outfit does look a little British . Love it ! you look amazing in hats! 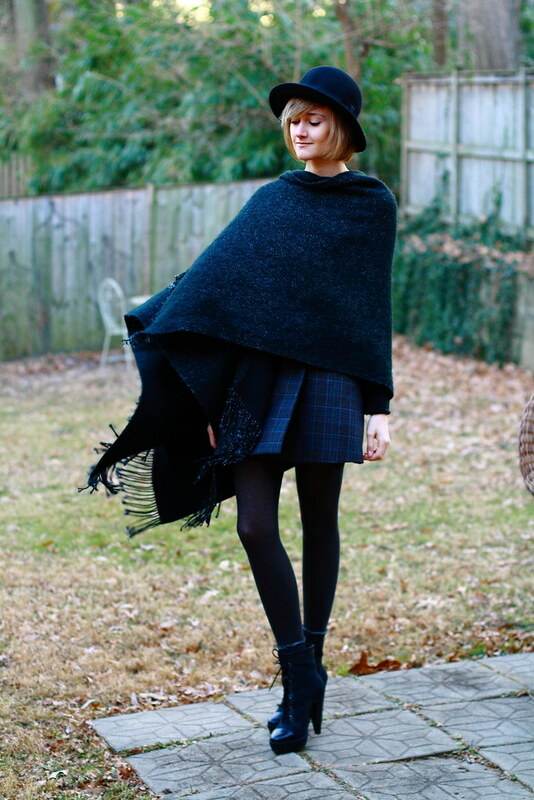 Love all of the pieces of this look, but especially your shoes and cape! you may not know how it came but it's a great combo, very trendy and cool! I love how big and overwhelming the cape is and how the skirt is on the shorter side. And the dark colors are very Moorish. A fantastic outfit, perfect I imagine for the English countryside. Looking fabulous! 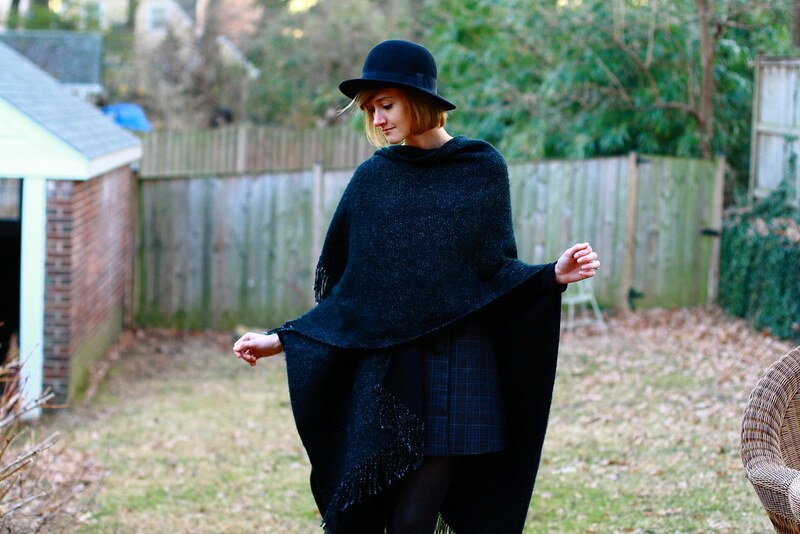 Capes are so effortlessly chic. the hat is so lovely! You look wonderful is all dark colors! Really like this on you. I adore this outfit! 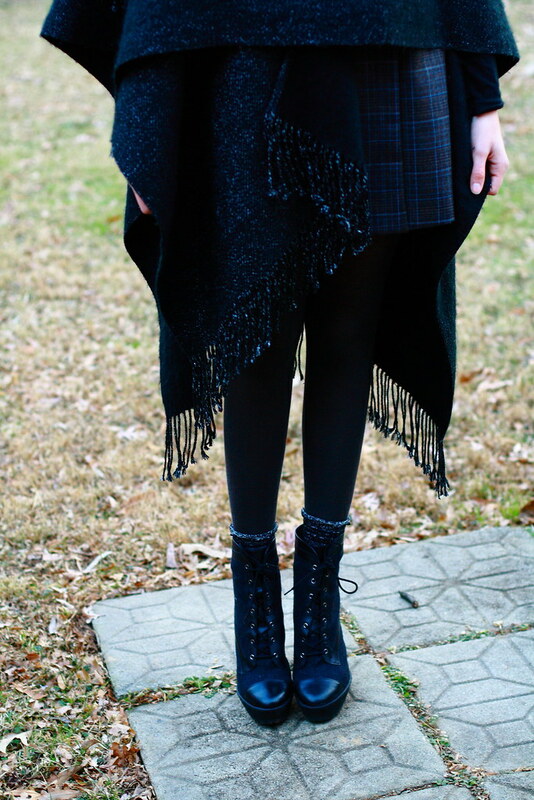 I really need to get some Pour la Victoire boots…I'm seeing them everywhere and their beautiful. Wow am I jealous of your ability to rock a hat like that! Gorgeous! I'm going to have hilarious daydreams about a cross-dressing Sherlock Holmes, now. He'll probably be the lead in Rocky Horror. You are the very picture of elegance! I adore this look, I think the boots fit in very well with your style!! You're too cute for words. Those Tory Burch boots a few posts down are to die for, too! What part of DC do you live in? I'm in Northern Virginia, and I am FOREVER trying to convince my LA/NYC friends that we're just as stylish as they are. LOving your shawl – so elegant! You look smashing! Something about this also makes me think of Zorro–I suppose the hat and cape combo? Either way, it works!! 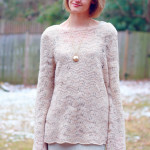 i'm so pleased I found your blog, you really do have lovely style and your pictures are so good! love your hair and hat! Ooo E I love how you styled it!! You look amazing – and those boots are killer! This is probably one of my favorite outfits of yours yet, and I love the British vibe about it. Very lovely, and those lace up boots are perfection. Is it chilly there? The tip of your nose is SO pink! heheh, just the tip though…lucky you – my entire nose gets red when I'm (a) hot (b) crying (c) cold (d) embarrassed (e) drinking……..ohh sad days for me and my drunken Irish nose. Love that shawl – as always, endlessly elegant! Ooh, there is something SO lovely about this! I like it! I agree, there is definitely a little sherlock holmes-iness happening here! Very cute! pour la victoire = AMAZING. love this look! You look fantabulous! I adore the shawl. love your cape, darling, it's beautiful! That shawl is to die for! Those boots are amazing. I can see the Rocky Horror Picture show thing you feel, but I definitely don't think that's a bad thing. They look awesome. Don't think Rocky Horror (although a great movie) The boots are sensational. I now need and want a plaid skirt. Its deems appropriate for winter. What a great outfit, absolutely gorgeous! Very British vibey indeed. The hat looks so cute on you. That is a pretty skirt. Oh man I love that shawl and the shoes. These photo's are fabulous. Hi! I just discovered your blog because you posted something about thi fall's Rag and Bone in another blog which I completely agreed with. So I said, lets check out this girl…and then I fell in love. Your STYLE is amazing! And beautifulo shots aswell. I just started my blog and you are truly an inspiration. What camera do you use? Ahh that hat is so cute! And I adore those boots! I love all the dark colors in this look, perfect for a female Sherlock! these photos are stunning and that shawl is beautiful on you! awesome outfit! you look so beautiful! I think lace boots have become my life savers this winter. They go with everything, and the thick soles make you look tall and slim (not that you'd need this, E., you look tall and slim and amazing already). 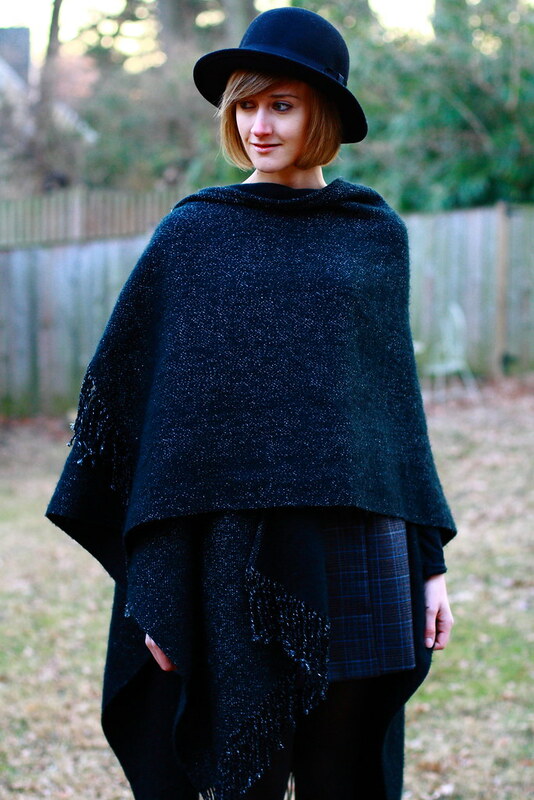 Love the 'British Blanket look', my only problem with ponchos and capes is… What to do with the bag?!?! You never cease to amaze me, this look is so spectacular, and the photos capture it beautifully! Beautiful outfit! I love the dark colors and you look so adorable all wrapped up in that cozy cape. I am also in love with the outfit in the previous post, everything about it is Perfection! Great outfit.The hat looks really good on you. wauw you look so great!! Stylish and comfortable at the same time 🙂 I really like your header btw!